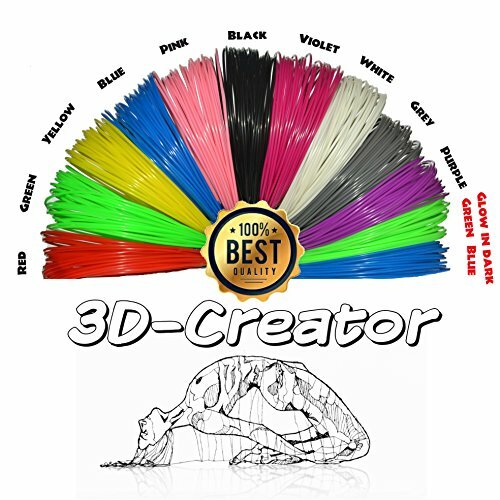 3D-Creator 3D Printing Filament Material- 1.75mm ABS Plastic Loops- 12 Colors Included- 10m of Each Color- 120m In Total- Toxic- Free 3D Printer Supplies- Bonus Included In The Pack! Fill Your Life With Colors And Re-fill Your 3D Pen At The Same Time. You simply can’t stop designing your favorite objects since that time you first held your 3D pen in your hands. Because now you can express your figments of imagination in a different way- you can simply create whatever you have in mind. Well, it’s not that tragic as it sounds! Because we can proudly present you our PL refill filaments for 3D pens- what else do you need? What’s Better Than A Risk-Free Product? Nothing’s better than that. Especially when those 3D pens are used by little children. Forget about toxic materials with a strong odor- now you can relax and keep creating without having a single care in this world. Perfect for all 3D pens that feature a 1.75 mm design- stop worrying whether you’re making the right choice! We’re pretty sure that you’ll keep designing non-stop straight after you’ll get those loops in your hands! Bonus Gifts Included. Because We Care. Let’s face it- there’s nothing better than bonus gifts that make our lives easier. That’s why not only 10 colors are included (white, black, red, green, yellow, blue, violet, gray, pink and purple) but two more colors (green and blue) are inside the pack, which can be visible in the dark! An extra e-book is included in order to get inspired: check the 50 stencil design we suggest you! Keep Creating Without Limits. Express Yourself With Colors. Order Your 3D Pen Refill Filaments Today. THE LONGER THE FILAMENT, THE BETTER THE RESULT: Forget about refilling your 3D pens all the time- now you can get those 32.8 feet loops (393 feet in total) that are going to serve you for the years to come. Save your peace of mind once and forever and keep creating without any hassle! FITS THEM ALL: Stop worrying whether these filaments are proper for your 3D pen- thanks to the 1.75 mm ABS design, these colorful filaments refills are going to fit all conventional 1.75 mm 3D pens and printers! THE HIGHEST QUALITY THAT YOU DESERVE: Now you can keep creating without having a single care in this world, as this one-of-a-kind filament set features a safe ABS construction; the non-toxic and odor-free design is just what you need in order to let your little ones creating their favorite objects without worries. BONUS GIFTS EXCLUSIVELY FOR YOU: Yes, you got it right- besides the multiple colors included (white, black, red, green, yellow, blue, violet, gray, pink and purple) two more glowing-in-the-dark colors are included in the pack (blue and green). Have you run out of ideas? Get our free e-book that includes 50 stencil ideas- what else do you need? WE GUARANTEE YOUR SATISFACTION: We want our clients to be happy, so just in case you feel disappointed with your purchase, we guarantee to give your money back instantly, without any hassle. Providing the highest quality to all of you is our main priority and our number-one goal. Posted on June 12, 2017 Author Best 3D PrinterCategories 3D Printing MaterialsTags 1.75mm, 120m, 3DCreator, Bonus, color, Colors, each, Filament, Free, included., Loops, Material, Pack, Plastic, Printer, Printing, Supplies, Total, ToxicLeave a comment on 3D-Creator 3D Printing Filament Material- 1.75mm ABS Plastic Loops- 12 Colors Included- 10m of Each Color- 120m In Total- Toxic- Free 3D Printer Supplies- Bonus Included In The Pack! Follow Your Heart Do What You Like ! Ever had 3D filament get stuck in your pen or printer ?Are you tired of 3D filament clogging when printing and a strong smell of it ? Trust me, it’s the worst… And it takes FOREVER to unclog. This used to happen to us all the time in our work, so we decided to do something about it – and we’ve finally created the smoothest, brightest, and strongest 3D filament around! Focus on creating art instead of wasting time fiddling with low quality filament. We know you are ambitious and enjoy working on large projects. Stop worrying about running out of filament. We provide you 640 feet of filament so you can get the job done. We pride ourselves in having excellent customer service. If you aren’t happy, for any reason, we offer a no questions asked 90-day full refund. MORE SAFER, MORE STRONGER, MORE BETTER: Nontoxic PLA is a clean & safe alternative to ABS 3D pen filament. 20 UNIQUE COLORS: A variety of color combinations,which gives you more options when creating your 3d artistic masterpiece for both school projects and adult masterpieces. PREMIUM MATERIAL: This 3D printing package comes in 1.75mm round PLA, each pack 10 meters and A case of 20 packets. Every color of the 3D printing filament are packed in vacuum bag to avoid corrosion. HIGH QUALITY MATERIALS :Our products are made with the highest industrial standards with optimum flow property through the extruder, tube and nozzle. At the same time, it is waterproof and sun-resistant 3D material. USED IN 3D PENS AND PRINTERS: Our products have a wide range of applicability. It can be used for the refill of almost all the 3d printer pens. PLA materials with no any flavor or toxic substances, create a Rosh and safe and healthy environment for you when drawing .It is easy for you to clean the pen nozzle when it blocked . 20 fun colors each packing for your different requirement and bring you all kinds of 3D drawing experience and enjoy your 3D printing life . Longer length : Durable 32.8 Ft for each color and 1.75 MM Diameter . Print temperature : ranges from 215 to 250 degrees C (419 to 482 degrees F) is best . General size : compatible with all 1.75 mm diameter 3D printers drawing pens. Flexible color : 20 fun colors each packing for you creating different 3D frame works .